After the longest January ever, does anyone feel like February is flying past already? It's less than 10 days until Valentine's Day already. Is it bad that I've got nothing for my husband yet, even though it's. our first as Mr and Mrs? We don't normally do much for Valentine's Day, maybe out for dinner around Valentine's weekend or a wee gift, just something that's a little bit of fun. 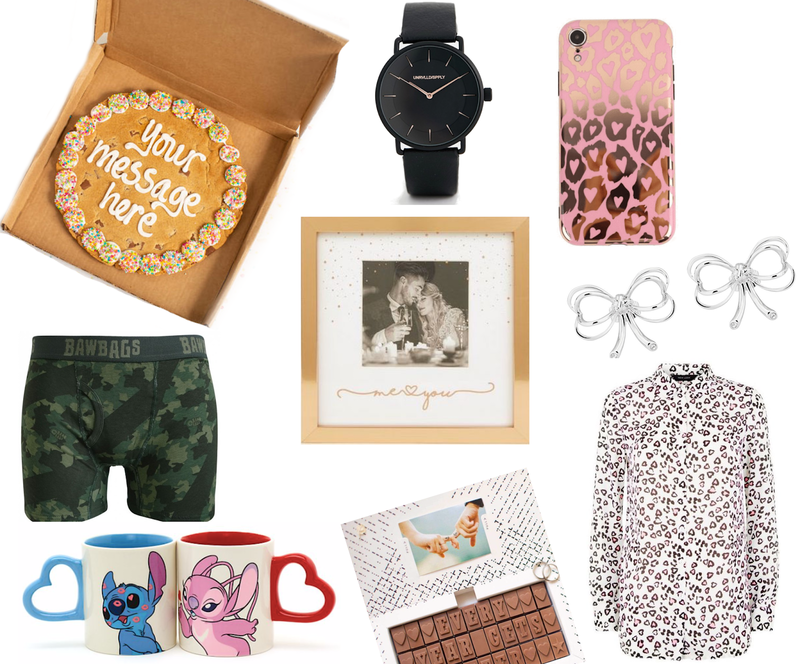 I've put together a little His and Hers Gift Guide so whether you're embracing the loved up occasion, want to treat yourself, or have plans to make it into a day for friends then it's not too late to order some of these affordable presents. The way to my husband's heart is definitely through food so it's little wonder I've added a Personalised Chocolate Chip Cookie and Message in Chocolates to my selection. To be fair I'd love to receive either of these two and they'd be brilliant to share while curled up on the sofa watching a movie together. A bit of jewellery is always a special gift but it doesn't need to be expensive. The Black and Rose Gold Watch would be brilliant for him and only costs £22 from ASOS. The Ted Baker Silver Bow Earrings are on sale on Amara coming in at less than £30 for one of my favourite designer brands. Stick some hearts on things and it's instantly a Valentine's appropriate present. With animal print being on trend just now the Rose Gold leopard phone case and Heart Animal Print Shirt are perefect gifts for her this year. I've already got the New Look shirt and would 100% recommend it for a Galenine's gathering. Keeping up with the clothes and accessories theme, my husband loves a pair of Bawbag Boxers so when better than Valentine's Day? My last two ideas are for the home, a Rose Gold You and Me Frame and Stitch Couple Mugs. I love the font on the frame and it would be gorgeous with a wedding photo in the middle. I love the his and hers effect of the Disney mugs - how adorable are the heart handles.